It's been another crappy week in terms of bitcoin price. When will the next bull run come again? PeerNova has raised $8.6m in a Series A round led by Mosaik Partners as it seeks to pivot from providing enterprise bitcoin mining infrastructure to enterprise blockchain software solutions. 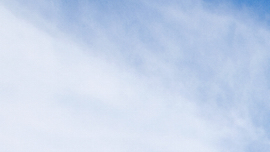 PeerNova was formed as a result of a merger between mining companies HighBitcoin and CloudHashing. A group of Florida residents have been accused of fraudulently selling scrypt mining ASICs as part of an altcoin 'pump-and-dump' scheme. The scheme centered on an altcoin called cachecoin, whose market is said to have been manipulated by the actions of the defendants. The defendants are also accused of stealing funds raised for an independent mining operation, Fibonacci Scrypt Mining ASICs. 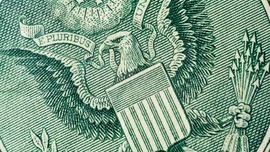 Kyle Torpey explores the pros and cons of government-issued cryptocurrency in this article. The launch of GAW Miners’ new altcoin, paycoin on 12th December led to a speculative boom in mining rig rental prices and a boost in altcoin trading. The coin has attracted attention due to the ongoing discussion surrounding GAW Miners, promises of crypto 2.0 functionality and a commitment to shore up its price at $20. 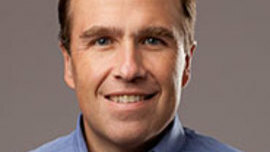 Ziftr CEO, Bob Wilkins was interviewed by CRN where he talked about ZiftrCOIN, ZiftrWallet and ZiftrPay and how he is very excited about how Ziftr can play a role with this cutting-edge technology. Sponsored: Participate in the ziftrCOIN Presale and help us bring cryptocurrency into the mainstream! Ziftr launched it's presale for ziftrCOIN on Dec. 9th. The Presale runs from now until January 23 or sooner depending on when the coins run out. 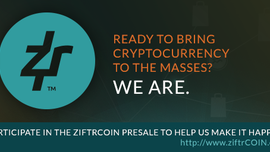 ziftrCOIN is an innovative altcoin designed to onboard the next 10 million cryptocurrency users and to help fulfill Ziftr's goal of bringing cryptocurrency into the mainstream for consumers and retailers. Vertcoin's recently changed its hashing algorithm from Scrypt-N to Lyra2RE and this article gives a brief description of the change. Tim Swanson curated some useful link on Eris, a smart contract / decentralized application platform. The Conference of State Bank Supervisors (CSBS) has released a draft proposal for regulating digital currency businesses. 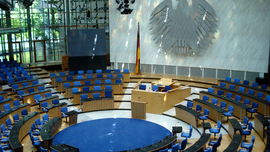 The membership group outlined a number of areas in which it believes companies that work with digital currencies should be supervised, including approaches to consumer protection, licensing and security. New York plans to soften proposed rules for BitLicense after receiving a round of public comments. Start-up companies dealing in the budding technology could get a two-year partial waiver from complying with the full set of rules. The new rules would also not apply to software developers, individual users, customer loyalty programs and gift cards, currency miners, nor to merchants accepting it as a payment. 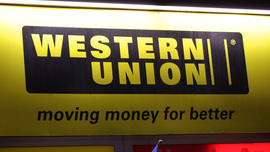 Several legal experts share their view on the Western Union comments on the BitLicense. 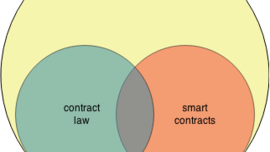 Florian Glatz try to shed new light on the nature of smart contracts by making hidden assumptions explicit and clarifying some misconceptions around the mysterious phenomenon in relation to the legal system. 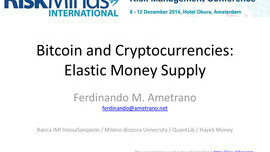 This is the presentation slide of Ferdinando Ametrano on an Introduction to Bitcoin and Hayek Money that was presented at RiskMinds International 2014 in Amsterdam. 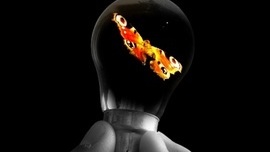 Nick Szabo wrote an insightful article on trustworthy computing.